The annual catalogues of the heroic Mosaic Records label, specializing in top of the line box sets of Jazz recordings, offers not only a complete listing of the label's releases but also stories and news about the label. 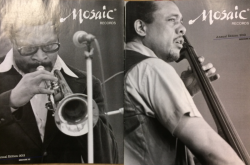 The 2012 Mosaic annual features Charles Mingus while the 2013 annual features Woody Shaw, both premiere releases for the label in those years. The annuals remain informative for discographers and attractive for their visuals.